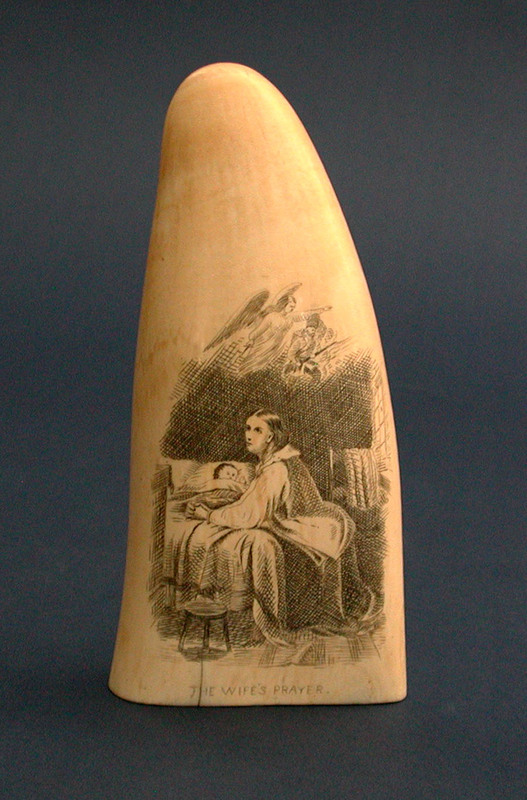 19TH CENTURY SCRIMSHAW TOOTH with a charming interior depiction of a young woman kneeling at the bedside of her child. She is presumably praying for her husband who is likely at war because above the scene is a Guardian Angel hovering over and protecting a uniformed soldier who carries a rifle with bayonet. Very nicely executed by a quite skilled engraver. Well shaped and quite solid tooth that measures 6 1/2" h. x 3" w. Condition excellent having just two fine but sound age cracks at the base. Quite sure it was copied from a 19th century print but I only did a quick search in an attempt to find it. A very attractive scene that was probably executed by a professional engraver.